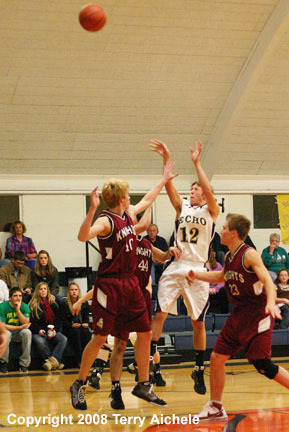 Echo and WWVA players including number 21 Ethan Marcum, battle for position during a rebound. ECHO - The Echo Cougars hosted WWVA in an evening game on Saturday, December 6, 2008. 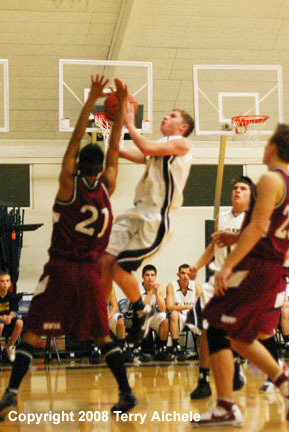 WWVA won 72-54 with Brad Luce contributing 22 points. Echo played well in the first quarter staying with four points at the end of the period. However several players started picking up fouls in the quarter that would haunt them as the game progressed. WWVA ended the quarter with a lead of 15-11. WWVA controlled the game in the second quarter taking a 39-27 lead at the half. Once again Echo picked up a lot fouls during the quarter. 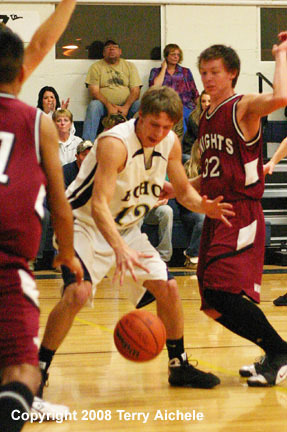 WWVA held Echo scoreless for about three minutes in the third quarter. Both teams made a lot of fouls but Echo had more. WWVA lead at the end of the third quarter 55-37. Both teams scored 17 points in the fourth quarter. The trips to the foul line continued for both teams. WWVA won 72-54. Echo ended up committing 33 fouls. WWVA committed 31 fouls. It works out to something like a foul every 30 seconds. Three Cougars fouled out. Three other Cougars had four fouls. WWVA had two players foul out and two with four fouls. Brad Luce of WWVA lead all players with 22 points. Miles Bell of WWVA had 13. 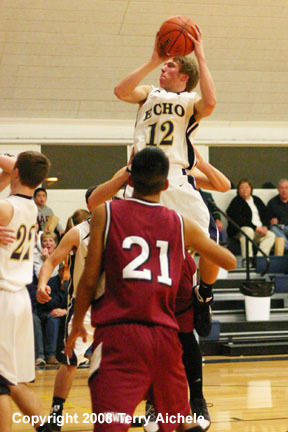 Echo was lead by Ryan Ramos and Colter McCallum each with 13. Then Glen Swanger with seven. Then Andy McFarlane and Micah Danner each had five. LEFT - Ryan Ramos of Echo takes a shot. RIGHT - Ryan Ramos of Echo controls the ball in the middle of a bunch of WWVA defenders. 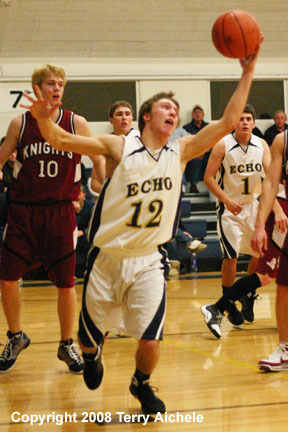 LEFT - Andy McFarlane of Echo drives to the basket. RIGHT - Ryan Ramos of Echo leaps into the air to take a shot. LEFT -Ryan Ramos of Echo grabs the ball. 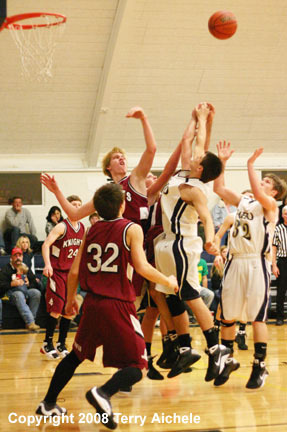 RIGHT - Both teams battle for a rebound. 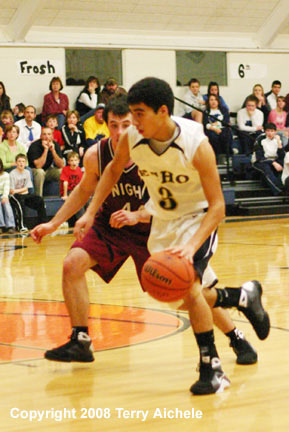 LEFT - Jorge Munoz of Echo with the ball. RIGHT - Some Echo fans left to right, Taylor Mize, Jack Taylor, and Kelan Danner. 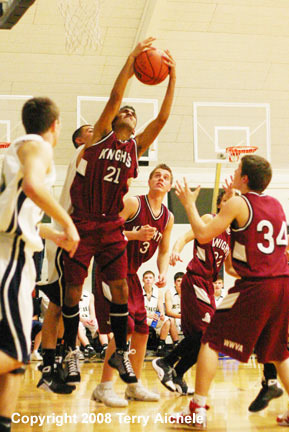 LEFT - Israel Campechan of Walla Walla grabs a rebound. 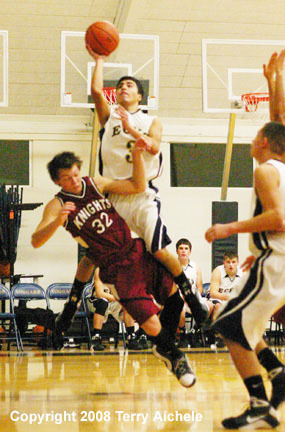 RIGHT - Jorge Munoz of Echo drives in for a layup. 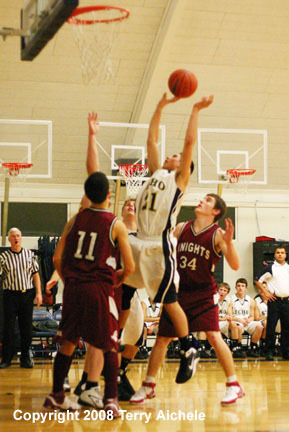 LEFT - An Echo drives to the basket. 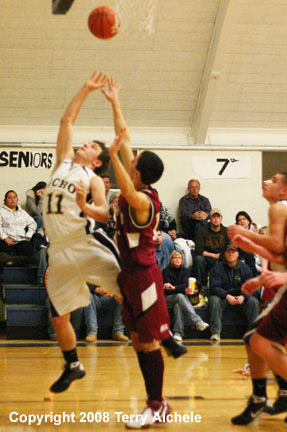 RIGHT - Echo's Ethan Marcum takes a shot.